We’ve gathered five of the favourite things to do on a day out in Crete – you can easily fit all five into your week-long, sunshine-filled holiday. From short but thrilling boat trips spotting fish and turtles, to half-day gorge hikes that’ll get you working, the variety is wide. Other picks include former Minoan palaces and current top 10 listed beaches. Consistently ranked one of the top 10 beaches in the world, Elafonissi stands out as a pink coral sand beach edged by a shallow, warm water lagoon. Black rocks rise out of sea, perfect for snorkeling around and due to the shallow water it’s a great place to take the kids. There are lifeguards on duty here and a small taverna for snacks and drinks. But to escape the crowds that arrive in summer all you have to do is wade across the lagoon to the island nature reserve on the other side. Look out for the scented, white sea daffodils growing wild but make sure not to pick these protected flowers. If you’re not a fan of snorkeling or have the kids in tow, taking a semi-submarine excursion from Aghios Nikolaos is the way to go. This part submerged boat has a glass bottom so sitting in the air-conditioned hull you can look through the clear water all the way to the sea bed. Regular appearances are made by fish including barracudas and conga eels, and you’re likely to spot a couple of turtles too. After an hour viewing the ocean with a commentary on the sea life, a further half an hour is spent up top looking at places of interest on land, all for a cost of €16 per adult and €10 or under for kids. Five kilometres southeast of Heraklion are the remains of a vast palace that’s quite literally the stuff of legends. The original palace of King Minos was built in 1900 BCE, covering an area of 22,000 sq metres, but settlement has been evidenced here as early as 6000 BCE. It’s said in Greek mythology that the half-man, half-bull Minotaur lived in a labyrinth under the palace, fending off anyone who entered the maze. What’s definitely true is that Knossos was the birth place of Hersifron and his son Metagenis, who built the Artemis temple in Ephesus, one of the Seven Wonders of the Ancient World. At just under 16 kilometres Samaria Gorge is the longest gorge in Europe so you need to be fit to walk it. This steep ravine has been eroded over time by a river to form a sheer-edged limestone ravine and is only accessible during May to October when the river isn’t flowing strongly through it. Guided tours will take you from the Omalos plateau to the seaside village of Agia Roumeli, which takes four to six hours over steep rocky paths and boulders. You could instead walk through the National Park of Samaria and peer over the edges from the villages at the top. Either way you can spot some of the 400 varieties of birds that live here, including owls, eagles, falcons and vultures. And you might be lucky enough to see the rare kri-kri Cretan wild goat. 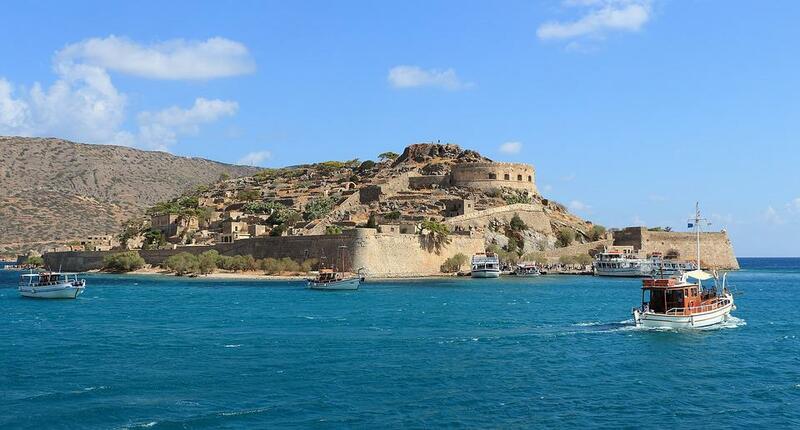 You’ll arrive on a boat from Elounda or Aghios Nikolaos, and pass through the so-called Dante’s Gate, to discover the legacy of lepers who lived on Spinalonga island as recently as 60 years ago. When you dock you’ll find their small community complete with shopping streets, cafes, a cinema, church, allotments and a hospital. There’s a compact museum telling of the island’s history as a leper colony and previously a stronghold for nearby Elounda, complete with 17th-century Venetian fortress. If you read the bestselling book that’s set here, The Island, by Victoria Hislop, you’ll get a whole new outlook on the place – based on both fact and fiction. Is there somewhere we’ve missed off the list that makes your Crete top five? Let us know in the comments below.